Frequently Asked Questions for the Admin & ART Teams! How do I subscribe/unsubscribe to topics? 1. While logged in, go to your User Control Panel (UCP) at the top right (found by clicking your username) of your screen. 2. On the left side, click Board Preferences. 3. The left menu will change accordingly. Click Edit Posting Defaults. 4. Notify me upon replies by default: Make sure No is checked, click Submit. The chat says notice: You have received a new message! but there is no message. This is what we call a "ghost message." These are harmless notices that happen every once in a while. At this time their cause is unknown. Why is the chat laggy today? How do I change my username on chat? You may only change your Username once every 30 days. 2. On the map screen, hover over My Account. Note: Be sure to read all information provided before submitting your name change. How do I change my chat password? You can also do this while in a room on Wolfhome by clicking the Info button under the chat field bar. 4. There should be a Password field for you to type your new password. You will need to enter it a second time in the next field, Enter it again to verify. Once you click Save your new password will be applied. Be sure to remember what you change it to so that you can login easily. I have a bunch of questions on using the forum, where do I look? When logged in, look toward the top right corner. You will see a FAQ Button, go ahead and click there. If you've looked there and still can't seem to find what you're looking for, please post in this forum or PM a Forum Administrator or Moderator. A list of forum admins and mods can be found in this thread. The username I want on the forum is taken, but they haven't used it. What do I do? The most appropriate thing to do would be to PM a Forum Administrator. A list of those members can be found here. My account closed due to inactivity. Can I re-open it and still have my poses? Sadly no. Inactive accounts are deleted after 30 days of no activity to free up server space. You will need to make a new account and start fresh. Unfortunately there is no way to retrieve poses or rooms once an account has been removed. To avoid this you may want to consider saving your poses to your hard drive or on an image hosting site, just in case. The chat name I want is "unavailable" but when I sniff them the account doesn't exist. Sometimes bans last a long time (even permanently!) and when an account is banned, the name becomes unavailable. If you desire a name on chat and can't obtain it, making a Problem Ticket may result in the name being made available again for use. Note: Sometimes there are reasons names are not freed up in which we would not be able to disclose. We apologize if this causes you any inconvenience. I have a delta issue, what do I do? If you are experiencing any kind of delta problems, please send a Problem Ticket explaining in detail the situation you are having. Alphas check these frequently and will be able to resolve your problems accordingly. No. The only time a whisper is seen is if an alpha must perform a log check, which only happens on extremely special occasions where logs are entirely necessary to retrieve. Only alphas can check logs and this information is kept private - the administration will never invade or breach anyone's privacy by any means. This is easily fixed by accessing the bodyshop with the !go poses command in chat, or from the map. Simply click the save button and wait patiently while Wolfhome recolors your default set for you. You should then find your missing pose issue resolved. I can't get into a room because it won't load! I get a black/white screen or an error message. 2. You may need to empty your cache/cookies. To do this, open your browser and press ctrl + shift + delete. Make sure "cookies" and "cache" are checked, then press OK. Restart your browser and you should be able to access the chat. Be sure to click here and check out this thread - it contains hints and tips on how to make sure your cookies and flash are set up right. It's very simple to do and should only take a minute or so. If updating, changing your browser, and emptying your cache has not worked, feel free to make a thread in the Technical Support section. Be sure to leave details of your antivirus software (name and version) and any other information about the problem you have. There are 14 people in a room, yet the room is full. Why can't I enter? People logging onto more than one chat at a time may cause this. You may have to wait until the room goes down to 10/12 for you to be able to enter successfully. I'm waiting for my delta transfer email, it hasn't shown up. Where is it? Sometimes the email will be in your account within minutes, though sometimes it can take a few hours. Don't forget to check your spam folder. You can always submit your request again until it shows up - just be sure to only activate one if it happens to send you multiple versions of the same request. Always read the Art FAQ before asking a question! If you have had a pose rejected and want to know more about why, it is better to email or PM an art review team member directly than post it here. A list of current members is located here. Please remember to follow the general posting guidelines of the Wolfhome forum when posting in this section. Who are the ART, and what do they do? This list of members of the ART is always up to date. They are here to insure the visual quality of the chat remains at a decent professional quality. They will either accept or reject poses according to the set standards of the chat. The Art Staff are also responsible for checking your uploaded rooms and to make sure that your avatar, sniff, and signature images in the chat and on the forums are appropriate for Wolfhome. If you see them on the site, give them a nuzzle of thanks and please don't bombard them with too many questions! Remember though, they're here to help out the best they can, but they're also here to chat too! How do I get a pose?! Finding poses is pretty simple! This topic details the basics on how to find poses. What can I be on Wolfhome? The simple answer is "a wild canine." But you aren't limited to just that. A full list of allowed species and where they may be used is available in this topic. How long will my pose take to process?! Poses typically can take anywhere from one minute to three or four days. If your pose has been in the uploader for a week or more, it is encouraged that you contact a member of the ART directly, or be sure to check your email for an explanation. What is the comment box for? The comment box helps the ART check your poses faster, for more information on how to use it, click here. My pose was rejected, does this mean I can never use it? Nope! In most cases poses are rejected for simple reasons which can be fixed easily. Unless the rejection reasons state otherwise, you may reupload your pose once it has been fixed. When a pose is rejected it will be supplied with a reason as to why it was rejected. The art FAQ contains a lot of information on what is and isn't acceptable. To get more help on a rejected pose, please contact a member of the ART via chat or forum PM. Rejected poses are not to be discussed in this section of the forum. My pose is being rejected because I am not supplying the right proof, but the link said it was free! Some links aren't reliable and can/do contain art theft. The ART is very vigilant about links that are provided. This thread provides in-depth information about links and the comment box. I bought a pose and it isn't on the permissions yet, what do I do? My pose was accepted as mythical, I don't understand why. The mythical category is reserved for quite a few different things. Obviously any mythical creature is placed there (e.g. dragons, unicorns, phoenixes) however some hybrids that are less than 80% canine may be put in this category. If you wish to dispute this, please contact us via PM or in chat. Another reason may be if the pose has a plushie that is large, has special effects, or looks animated. For more in-depth details, this topic should be of use to you. What about private rooms, how do I get one? We have a FAQ dedicated to private rooms which can be found by clicking here. Who made the art on Wolfhome? The original artwork for the Wolfhome wolves was done by our very own Goldenwolf. Later, default sets were created by Blueflamewolf (Fennec set), Chennoue (Modern set), Cobweb (Jackal set), Galagya (Coyote set), Saebre (Fox set) and Kesame (Pup set). Thanks to their hard work and dedication, your wolf comes equipped with a variety of poses. As you've probably discovered by now, you can use The bodyshop to recolor your default poses and give them your own distinctive styling. If color selection does not give you enough control over your wolf's look, you can further customize the poses by downloading your current poses onto your PC and editing in the details you feel you should have. 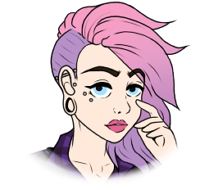 With only a little experimentation, you can use your favorite paint program to add piercings, tattoos, and even clothing to your current poses. Don't have a paint program? I recommend Paint Shop Pro 7.0 from Jasc or Photoshop from Adobe. You can even edit your poses in MSPaint. You can contact the Art Review Team by either posting in the Art Review Team (this) forum, in chat, or if you have any questions, comments, or concerns regarding art. Forum PMs are fine, too. This topic will remain locked, if you have any questions or comments please direct them to the ART via this section of the forum, by PM, or in chat.